Alfred Sisley (30 October 1839 – 29 January 1899) was an English Impressionist landscape painter. He was a British citizen, but was born, and spent most of his life, in France. Sisley is known for his Impressionist landscapes painted en plein air, that is, outdoors. He never went into portrait painting and continued in the impressionist style all his career. Among his most important works are a series of paintings of the River Thames, mostly around Hampton Court, painted in 1874, and various paintings showing places in or near Moret-sur-Loing. Sisley was born in Paris to rich English parents. His father William Sisley was in the silk business, and his mother Felicia Sell enjoyed music. 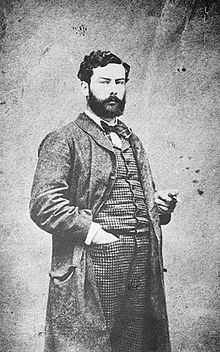 In 1857, at the age of 18, Sisley was sent to London to study for a career in business, but he gave it up after four years and returned to Paris. In 1862 he studied at the atelier of Swiss artist Marc-Charles-Gabriel Gleyre, where he met Frédéric Bazille, Claude Monet, and Pierre-Auguste Renoir. Together they would paint landscapes in the open rather than in the studio. This helped them to capture the changing effects of sunlight. This new approach resulted in paintings more colorful and more broadly painted than people were used to seeing. At first Sisley and his friends had few chances to show or sell their work. Their works were usually rejected by the jury of the most important art exhibition in France, the annual Salon. During the 1860s, though, Sisley was in a better position than some of his fellow artists, for his father regularly gave him money. In 1866 Sisley began a relationship with Eugénie Lesouezec (1834–1898; also known as Marie Lescouezec). They had two children: son Pierre (born 1867) and daughter Jeanne (1869). At the time, Sisley lived not far from Avenue de Clichy and the Café Guerbois, the meeting place of many Parisian painters. In 1868 his paintings were accepted at the Salon, but it did not bring him any financial or critical success, and neither did any of the subsequent exhibitions. The Franco-Prussian War which began in 1870 caused Sisley's father's business to fail. The painter's only income was from the sale of his works. He lived in poverty for the rest of his life, as the value of his paintings only rose in value after his death. Occasionally, however, Sisley would be helped by his patrons, which allowed him, among other things, to make a few short trips to England. The first trip was in 1874 after the first independent Impressionist exhibition. The result of the trip was a series of nearly 20 paintings of the Upper Thames near Molesey. Art historian Kenneth Clark said this was "a perfect moment of Impressionism." Until 1880, Sisley lived and worked in the countryside west of Paris; then Sisley and his family moved to a small village near Moret-sur-Loing. This was close to the forest of Fontainebleau where the painters of the Barbizon school had worked earlier in the century. Here, as art historian Anne Poulet has said, "the gentle landscapes with their constantly changing atmosphere were perfectly attuned to his talents. Unlike Monet, he never sought the drama of the rampaging ocean or the brilliantly colored scenery of the Côte d'Azur." In 1881 Sisley made one more short trip to England. In 1897 Sisley and his partner visited Wales and were married in Cardiff Register Office on 5 August. They stayed at Penarth, where he painted at least six pictures of the sea and the cliffs. In mid-August they moved to the Osborne Hotel on the Gower Peninsula, where he painted at least eleven oil-paintings in and around Rotherslade Bay. They returned to France in October. This was Sisley's last trip to England. The National Museum of Wales in Cardiff now has two of his Welsh paintings. In 1898 he applied for French citizenship but was refused. He made a second application supported by a police report. He became ill before the application was accepted, with Sisley remaining English until his death. The painter died of throat cancer in Moret-sur-Loing at the age of 59, just a few months after the death of his wife. Sisley's first works are lost. His earliest known work is Lane near a Small Town. This is believed to have been painted around 1864. His first landscape paintings are sad and gloomy, coloured with dark browns, greens, and pale blues. They were often painted at Marly and Saint-Cloud. No one knows if Sisley's knew the paintings of J. M. W. Turner and John Constable, which he may have seen in London. These artists have been suggested as an influence on his development as an Impressionist painter, as well as Gustave Courbet and Jean-Baptiste-Camille Corot. Among the Impressionists Sisley has been overshadowed by Monet. Sisley's work very similar to that of Camille Pissarro. Described by art historian Robert Rosenblum as having "almost a generic character, an impersonal textbook idea of a perfect Impressionist painting", his work strongly creates atmosphere and his skies are always very impressive. His concentration on landscape subjects was the most consistent of any of the Impressionists. Among Sisley's best-known works are Street in Moret and Sand Heaps, and The Bridge at Moret-sur-Loing shown at Musée d'Orsay, Paris. Allée des peupliers de Moret (The Lane of Poplars at Moret) has been stolen three times from the Musée des Beaux-Arts in Nice. The first time was in 1978 when on loan in Marseille, but it was found a few days later in the city's sewers. It was stolen again in 1998 and the museum's curator was convicted of the theft and jailed for five years along with two friends. It was stolen again in August 2007. On 4 June 2008, the French National Police found it and three other stolen paintings inside a van in Marseille. ↑ Denvir 2000, p. 265. ↑ Poulet 1979, p. 77. ↑ Turner 2000, p. 401. ↑ Rosenblum 1989, p. 306. ↑ "The Art of Catching an Art Thief - UPIU.com". upiu.com. Retrieved 2 January 2011. ↑ Willsher, Kim (7 August 2007). "Priceless paintings stolen at gunpoint from Nice museum". The Guardian. Retrieved 2 January 2011. ↑ "French National Pleads Guilty to International Stolen Art Conspiracy" (Web). earthtimes.com. 2008-07-10. Retrieved 2007-08-08.